Say what? Now that I have your attention – I’m going to tell you about a new strain of bacteria which quite literally, can help you lose weight! Have you ever heard of Akkermansia muciniphilia? Didn’t think so. After reading this post you’ll know all about it and why it’s the trendiest topic in the scientific weight loss community. It is a probiotic bacterium which lives inside most of us and has the amazing ability to control how much belly fat we have. Could this Akkermansia help you lose weight? Have you tried without success and feel a bit frustrated? Perhaps your best bet is to then eat to encourage this strain of gut bacteria to help you lose weight. It is said to improve metabolic rate, lower inflammation and strengthen immunity. A paper from back in 2013 by researchers at the University of Louvain, Belgium, concluded that this bacteria has the amazing ability to actively promote weight loss in humans. Sounds too good to be true but in healthy humans this bacteria makes up 3-5% of your gut bacteria, yet for some inexplicable reason, in obese people this percentage is considerably lower. Akkermansia not only repairs dysfunctional metabolic rate, it seems to have an impact on inflammation and diabetes too. All this just goes to prove once again the amazing part our gut flora play in keeping us healthy in every single way. So how do you get more Akkermansia? Before you get all excited and want to rush out and buy a boat-load of Akkermansia you need to know that at this time there is no actual supplement you can take which will give you this strain, as it is still in the process of being studied and tested which can take years. However, you can encourage our own colony of this bacterium (even if you have a teensy bit so you can encourage its growth) which is good to know. The Belgian researchers discovered that oligofructose (not fructose!) will improve the percentage. You will find oligofructose in my online store under the name of MaxiFOS. Another way to promote this bacterial species is by taking Psyllium Husks (I have these in my online store too) – as this Akkermansia absolutely adores fibre and prebiotics. (So much for the naysayers who slate fibre intake – such a necessary item in our diet). Prebiotic foods, dietary fibre, psyllium husk and oligofructose as found in MaxiFOS (which is a prebiotic) are the ideal food sources for Akkermansia which will promote its growth, as well as many other very beneficial strains of bacteria too by the way. These strains relieve constipation, IBS, diarrhoea, control diabetes and encourage weight loss. What’s not to like? They are all also very cost effective and easy to take, as they are either tasty (as in foods) or tasteless (as in the psyllium husk) or downright delicious as in the case of MaxiFOS. And now for the good news. Did you know you can start to change your gut microbiome in JUST ONE DAY? 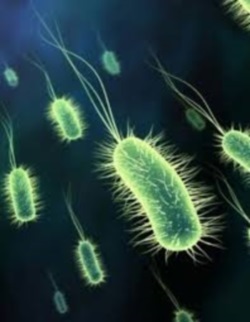 The average lifespan of the average bacterium is very short – just 20 minutes! So every time you eat, you can be encouraging and increasing your Akkermansia – one meal at a time! Imagine – in ONE DAY you can change your microbiome! Of course sleep, stress, environment, exercise etc all determine your microbiome too, but the greatest factor of all is your diet. So here’s a little breakdown of how to fast-track your diet to encourage that gorgeous colony of Akkermansia. No more sugar or carbohydrates from grains – get your carbs from non-starchy vegetables, especially leafy greens, radishes, Jerusalem artichokes, leeks, asparagus, garlic and turmeric. Eat fat and protein at every meal. Toss out the really nasty ‘foods’ like soy, corn, peanuts, seed oils, artificial sweeteners, gluten and grains. Relax and de-stress! Your gut is your ‘second brain’ and can take on the stress of everyday life so fast – throwing your microbiome out of balance, which may make you feel depressed, anxious or tired, create memory problems or brain fog. Getting your microbiome back into balance will help you lose weight – no more pounding the tar daily in an effort to shed a few kilos. Fibre is a vital key to promoting weight loss, but it has to be the right fibre, not brans or cereals. Fibre is critical to good health because it is food for your intestinal flora. When you deprive yourself of fibre on a regular basis (think of people who live constantly on refined food) your gut microbes behave erratically – they turn on you and start to eat the mucus lining of your intestine sometimes, as it’s also a carbohydrate source. If they are starved of fibre, they have no choice. Fibre is a carbohydrate which the beneficial flora eat – it does not count as a carbohydrate in our diets. Go to my shop here and use the search function if you get stuck – all the above products are there. Cheers!